There is never a shortage of outstanding BAE graduate students ready and willing to share their research. 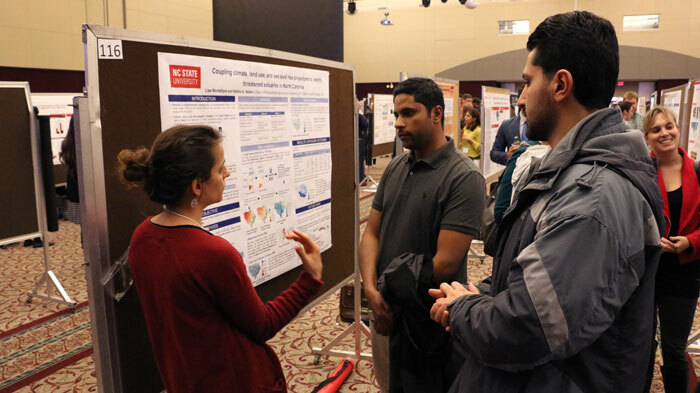 The Graduate Student Research Symposium is the perfect opportunity to share this research and interact with and learn from students across the university. 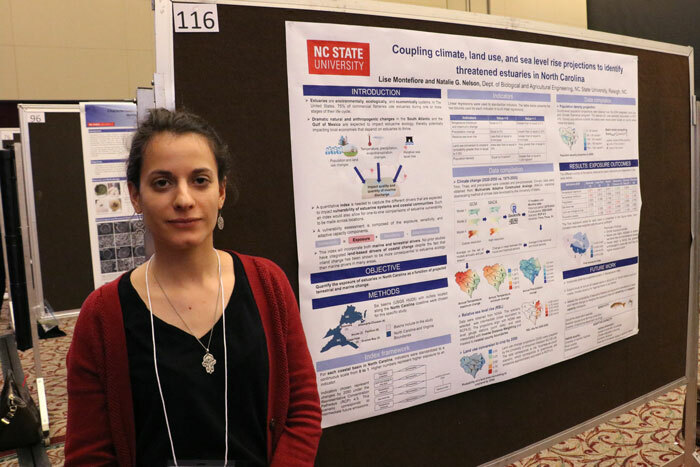 The 13th annual symposium, held each March, includes poster presentations from more than 200 graduate students from NC State University. Posters are judged by faculty, and students receive recognition for top posters. 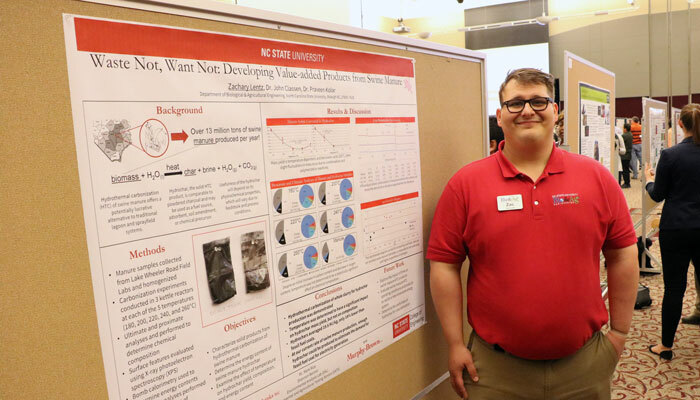 The goals of the symposium are to showcase the outstanding quality and diversity of graduate-level research at NC State, in addition to providing students with the opportunity to practice and enhance their communication skills with those outside of their discipline. The event is sponsored by the Graduate School and the Graduate Student Association and is open to the public. 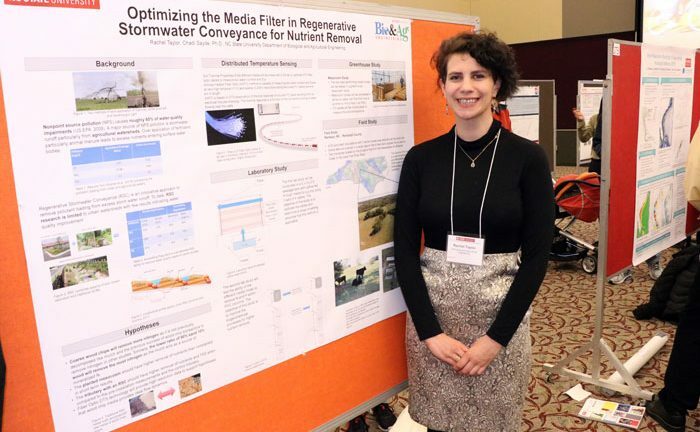 Lise Montefiore took 2nd place in the Agricultural Sciences and Natural Resources category of the Graduate Student Research Symposium. Lise works with Dr. Natalie Nelson in the Biosystems Analytics Lab. Her research focuses on quantifying spatial variability in the vulnerability of estuarine systems to global and local change. 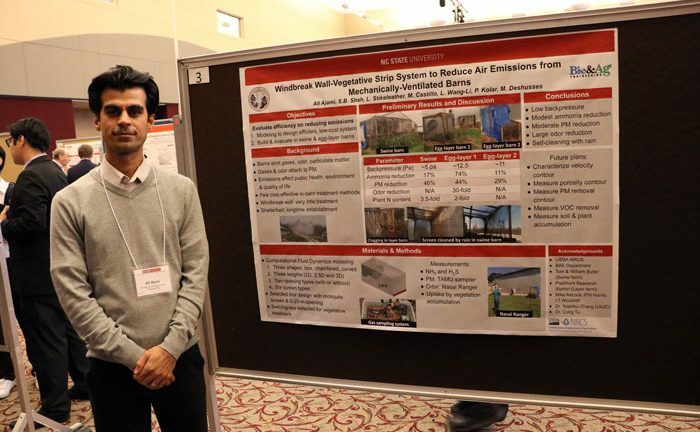 Ajami works with Dr. Sanjay Shah to design and test windbreak-wall vegetative strip systems to reduce air emissions from barns. “By communicating results with others that have the same concern or the same problems on farms or in the field, we can come up with ways to improve our project and come up with better solutions,” Ajami notes. Lentz works with Dr. John Classen and Dr. Praveen Kolar to develop value-added products from swine manure. Taylor works with Dr. Chadi Sayde.